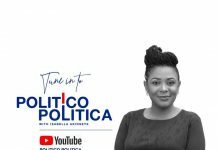 The YNaija series titled YNaija Politico is a platform where young candidates for various offices for 2019 can talk about their aspirations and how they hope to achieve whatever they have outlined to the people they hope to lead. It is, indeed, an opportunity to reach a wider audience. Are there reason(s) you chose politics to attempt to change status quo? There are a lot of things like vague representation, low youth involvement in party politics, ‘money buying’ politics, even our national and cultural integration programmes that need to be reviewed and, our actions and involvement in the polity is pertinent. I’m Chief Awosusi George Abbey Obayoriade, the SDP candidate for Ondo State House of Assembly, Owo constituency 2. I’m a graduate of Petroleum Engineering from the Petroleum Training Institute Nigeria. I am a social crusader/public speaker, the founder and National Convener of 9ja Youths in Politics, an organisation that was formed to sensitise, emancipate and reeducate our youth on the need to join and participate actively in politics. I’m a member of different organisations and professional bodies such as Rotary International (RI), Society of Petroleum Engineers (SPE), Nigerian Association of Petroleum Explorationists (NAPE), Society of Exploration Geophysicist (SEG). I am also the Project Manager of NIGERIAN ICON SHOW. How long have you been in politics? And what inspired the decision to run for a political office in an environment where the older generation think they should be the ones leading? I’ve been active in politics for three years now and my growth has come in a rapid form. It is true we are in a political environment dominated by the older ones but does that stop anything? Our youth are only afraid of rising up. We do not want to take risks. That is why I tell people, especially youth, that care to listen that my aspiration today is more of an advocacy and not the usual do or die style. It is an advocacy aiming to give hope to the hopeless, that at the end people would look back and say ” O Yea! If George Abbey can then I can”. This is the silent message. Is there a time you went beyond your comfort zone to ensure the lives of the people around – especially the grassroots – are improved? Like… what is the most significant change you brought about in your local community? Yes, I will state a few things I have done. About 10 years ago, I realised that in my hometown there was no event that brings us together especially during Christmas. So, I thought of hosting a football competition, that at that time I could not sponsor but I knew if I can think it, then I can achieve it. I eventually took it to my uncle, Mr Sunday Awosusi, a young CEO/ Entrepreneur for sponsorship. We named the tournament after his investment and a year after, aiming for more sponsorship, I introduced it to another uncle, Mr Sam ‘Niran Awosusi, who bought the idea. Since then, it has become an annual event. This has also given room for other competitions in the community where we have participating teams from different communities in the LGA. All thanks to the players who are the major stakeholders. Another instance was the musical show a friend in the music Industry – Mr Vincent Okiki the CEO Oracle Music Worldwide – and I organised last year. We realised a lot of talents abound in our society but no one is actually tapping into this as it should be, so, we organised the show to allow all artistes of all genres to participate. All that was spent was from our pockets. This too has kept our environment busy, entertained and even somewhat put us on the map. Actually, I’m a strong believer in engagement programmes. How important is this decision to run for the political office to you and the people you aspire to lead? Very important to all involved. At first, I never realised how important it was to me until I declared my intentions. The feedback I have received so far has been amazing and I’m so grateful to God. Thank God I have never misrepresented myself or my people, neither have my intentions ever been misinterpreted. Who in the Nigerian political space inspires you? And if there is someone, is the person a godfather? 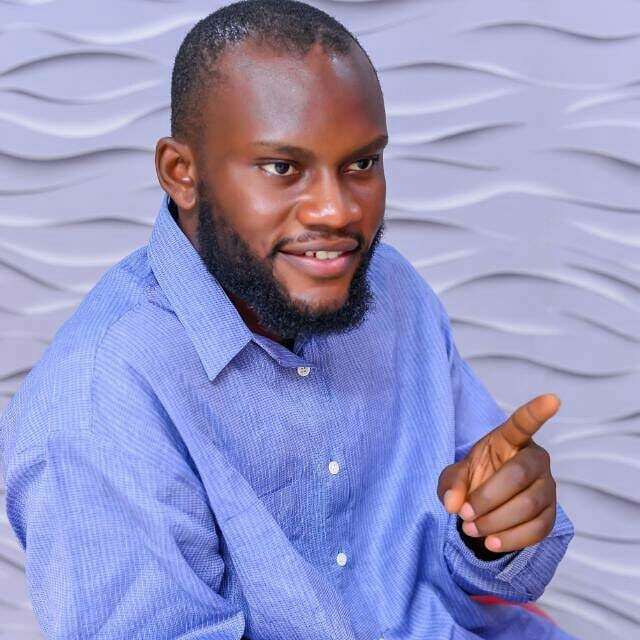 My teacher of course – Engr Dr Taofeeq Olayinka Ayinde (JP). He brought me closer to the table and taught me all the intricacies that I would never have learnt on my own. Above all, he taught me the Peoples Politics that we call politics for the people. Meanwhile, there is nothing like a godfather, all we have are people you can run to for advice. Just like when you have issues with your school works you run to your senior for clarification and explanation. At the end irrespective of the advice you take or get from them, the final decision lies on your desk. How far do you think you have progressed as a young politician? I still have a long rope to pull, but at a relatively young age and from a politically maligned and segregated community like the one I come from, I think I have been able to move past all odds, for these reasons I think I’ve progressed massively. How do you plan on tackling major issues such as unemployment, housing, healthcare and education? As a legislator my duty is to make laws and sponsor bills as it affects my people. So for those issues you highlighted, I will sponsor bills to solve those problems. When our people give us their mandate we shall, through our constituency allowance, introduce programmes that will dutifully engage our youth through sports, debates, talent hunts through artistic exhibition and scientific invention programmes and so on. Our market women and farmers shall be granted loans through our private/public sector collaborative investment programmes, a system where we shall as well monitor the development of all beneficiaries. Again, there are some huge influences that come with positions of power, and such influence is what we intend to ride on to go into offices, firms, organisations, schools (public and private) to seek job openings, scholarships, investment programmes either within or outside our State, and at the end such opportunities shall be brought to the door step of our people. We shall also make laws to standardise our culture, our value system, our identity, and so on, because most of our usual values have faded away without any form of preservation all in the name of civility. Do you think religion should play a huge role in Nigerian politics? If you think so, what would you say about the general idea that religion has so far hindered development in Nigeria? No, because religion should be keeping us together not tearing us apart, like we have it in this part of the world. In my yet to be published book titled “OUR DIVIDES”, I highlighted our divides into four categories namely: Religious divide, Ethnic divide, Social-cultural divide and Political divide. In it, I spoke as someone who has a background in all the three religions (Christianity, Islam, and Traditional). My paternal grandfather, AWOsusi was a herbalist, my maternal grandmother is a Muslim and my parents are Christians. From experience, these three religions preach two things, MORALS AND TOLERANCE… things that are relatively absent in our society today. We have instead turned our religious beliefs to issues of debate and topics; promoting disunity. We must understand that we were Nigerians first before becoming Christians, Muslims or Traditionalists. Yes, because to solve a problem we have to go to the root. Don’t be surprised that it is even in the churches and mosques today that we have more hate speeches against one religion or the other, so they have to start preaching tolerance as a way of life. During the time of Christ Jesus and Holy Prophet Muhammad (S.A.W.) there were people who never believed in their ways yet they tolerated them and preached peace to them. In your relatively short time in the Nigerian political space, are there things you have learnt that you will like to share? I have learned that those who made us can break us if truly they are determined to break us and I call that the deciding factor. I have as well learnt that politics is such a dynamic game that if one plus one equals two right now it can equal eleven or one in the next minute, and all answers surprisingly are correct, all you need do is to always move with the dynamics. How confident are you about winning the election in 2019? Very confident. God has really helped me this far, so if I’m not confident I won’t get to this stage. In case you lost the election, what will be the next step you will take? To me I have been trained to know that you never can lose as victory is the goal. I see politics as a love affair where no one that has loved completely will ever lose out completely. The experience gained and the influence gathered are some things you can leverage on anytime any day. I will like to leave you with this childhood experience of mine, as a child when the rain falls, we get a bowl to fetch it ,when the rain stops I’d see the moon in the sky showing in the bowl of water, then I’d get a cane and start hitting the moon in the water, whenever I get tired of hitting it, I realised no matter how much I hit the moon showing in the bowl it doesn’t affect the real moon showing in the sky, but at the end I am satisfied with the wave I had made with the water. I want to solicit support of all the stake holders in my constituency as my emergence would bring about intimate Social-cultural/Socioeconomic representation. 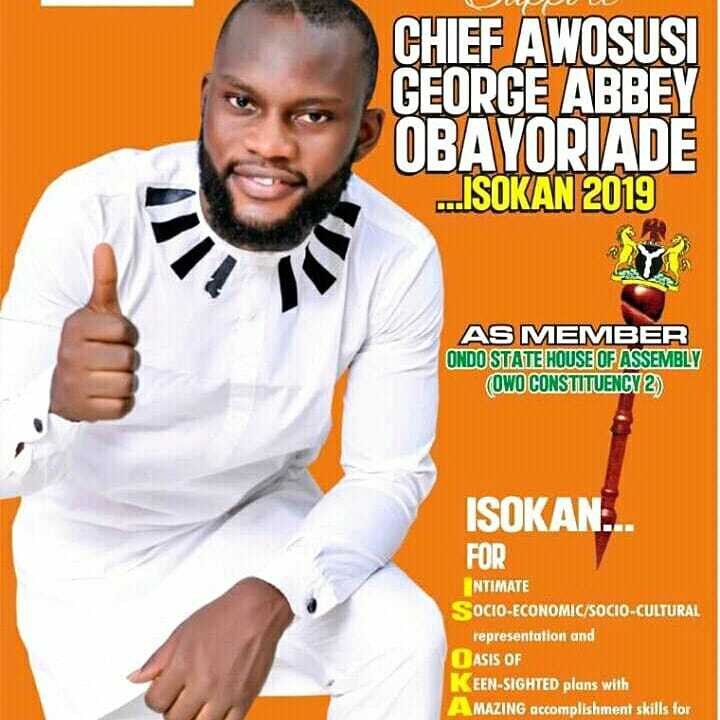 With oasis of keen sighted plans with amazing accomplishment skills for a better constituency in a true Nigerian State (ISOKAN 2019)…….ISE OLUWA NI! Should Nnamdi Kanu contest for president in 2019?